Big Brother 16 Spoilers - Power Of Veto Ceremony Results! Big Brother Spoilers > Big Brother > Big Brother 16 > Big Brother 16 Spoilers – Power Of Veto Ceremony Results! 11:15am – 12:05pm Big Brother blocks the live feeds for the Power Of Veto Ceremony to take place. When the live feeds return we learn that as expected Donny used the veto on himself. As HOH Caleb then nominated Joey as the replacement nominee. The veto ceremony just ended and everyone is hugging Paola and Joey. Joey says that its okay. She hugs Caleb and says that she understands she doesn’t hate him as a person. NO hard feelings. Caleb says it was a house decision and I heard your name more than anyones. Joey says you did what you had to do! Joey heads to the havenot room and lays in bed. Hayden joins her and asks her if she’s okay. She says she’s okay its just a game. The game got me again! Hayden tells her its not over yet! He tells her to rock out with her co*k out. 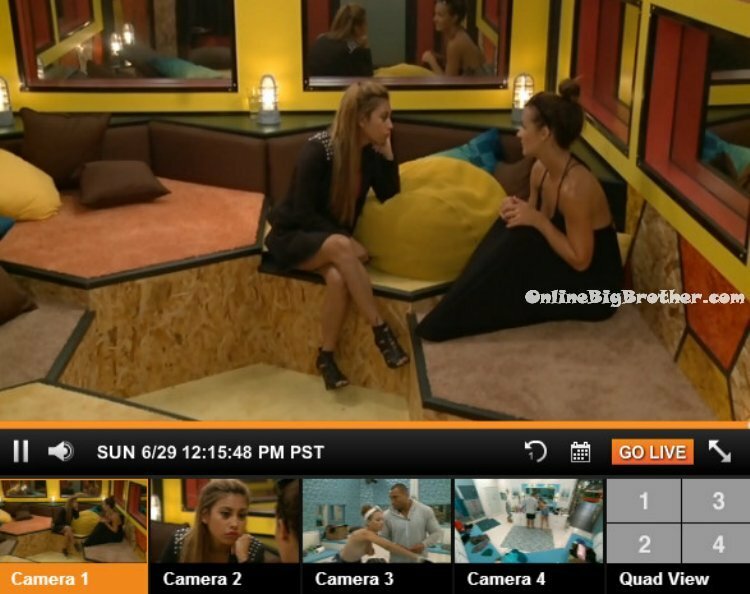 Meanwhile in the hive room Paola is talking to Brittany. Brittany says that she thinks people are going to vote out Joey. Brittany says that she thinks after the thing with Devin she’ll be the one going up next week. Paola says that she doesn’t trust Joey. Brittany says that she like Joey outside the game but thinks she would run over anyone in the game. Paola says the way Joey is playing the game is stupid. Paola tells Brittany she can’t go against the guys right now because that’s going to put a bigger target on your back. Brittany says I think you’re safe. If it wasn’t for Joey doing that I don’t think you would be safe. In the havenot room – Nicole is talking to Joey. She starts to cry. Nicole tells her its not over. Nicole tells her to come outside and get some sun. Nicole leaves and Devin comes in to talk to Joey. She tells him its just a game. Devin says that she should have come to him to make an ally with him and not come out with an all girls alliance. And I can still do that with you. Devin says I don’t want people rallying against me. Devin tells Joey that she is well liked in this house, more than he is right now. Joey says well obviously not, I’m on the block. He tells her if she can go clear things up with the house she might be okay. Devin talks about the drama about the sheets and the lotion. Joey tells Devin that he is a big target because he’s the biggest physical threat. Devin says not necessarily in a lot of comps. Devin says I would rather work with you than against you. Joey says I will go around I will have your back. Cody comes into the room. Devin says you have my vote if you can clean up your mess. Devin asks Cody not to repeat what he just said. Cody says he won’t and leaves. Paola comes in and gives Joey a hug then leaves. Joey says that she will talk to Brittany and make sure she’s okay with you. Devin says no I don’t want you to do that. Joey says okay, if I clean up my mess I have your vote. Devin says yes. Joey says and you have my vote. Devin says for next week. Joey says yeah. Devin says I will go around and campaign for you to be here this week and next. And maybe you and I can start an alliance or a secret alliance. Devin says the other day you came up to me and I want to prove to you that, that’s not how I am. Devin tells Joey that he thinks she’s attractive and was going to tell her that before she said she had a boyfriend. Devin says we will just lay low .. I don’t want anyone to catch on to it because you’ve seen what people do when they found out about the girls alliance. They end their conversation and leave the room. 12:25pm – 1pm Out in the backyard – Cody, Christine and Donny are talking. Donny says that he thinks Joey panicked when the girls alliance came out and didn’t know what to do. She should have just denied it. Cody says that he doesn’t think Joey knows the game. The cameras switch to Frankie and Zach in the HOH room. Frankie is telling him about the confrontations with Brittany. Frankie and Zach agree that Devin is bipolar. Frankie says that he is going to start distancing himself from Devin. Frankie says that he just isn’t going to try and help people now. Zach says that Devin is the biggest target and liability in our alliance. Frankie says that everyone is putting together contingency plans for when he explodes. The camera switch to the backyard with Derrick, Christine and Nicole talking about Paola and Joey on the block. Christine says its really between getting out a stronger player and a weaker one. Derrick says its really in our hands and we’ll see how the week plays out. The cameras switch to Paola and Caleb in the hive room talking. Caleb tells Paola to just keep quiet this week. What Joey did the other day really mad everyone uncomfortable. Paola says that Joey did that to herself and I tried to tell her that. Paola says that she doesn’t want to be laughed at. Caleb tells her to just leave the spelling alone. Paola says anything with standing, Spinning and spelling I need to leave alone. Anything with S. Caleb and Paola hug and leave the room. 1:10pm – 1:20pm Donny, Amber and Nicole are sitting on the backyard couch. Caleb joins them. He tells them about what he told Joey after he nominated her. Caleb tells them that he’s been offered a lot of money before to do p*rn. But that’s just not me. Caleb talks about Hayden running around n@ked, if I did that my mom would be balling. I respect Hayden, that’s just not me. Caleb says now a days girls like to be treated badly. Caleb says not like back in the day. He then asks Donny if back in his day did girls like to be treated badly. Donny says no you had to woo them. Nicole tells Caleb that she is sorry for thinking he was cocky before because now after he’s opened up she sees a different side of him. 1:25pm In the bathroom – Joey and Brittany change into their bikinis. Brittany comes out of the shower stall and looks at herself in the mirror and says you can see my purse! Are you supposed to be able to see my purse? They’re see through! 1:35pm – 1:40pm Paola asks Devin to talk to him. She tells him that she doesn’t want to campaign against Joey. Devin says I think you have 5 days .. well really 4. If I gave you advice right now would you take it? I don’t want you to say a word to anyone? If you mention anything, you could go home! Don’t say a word. I’ll be able to tell you after Thursday – You’ll be able to know who voted for you and against you. Its not smart for me to tell you how I am going to vote right now. I don’t know how I am going to vote right now. Devin says look at me … I can’t tell you how I am going to vote but I am going to run your name through the dirt.. like sh*t right now! Paola asks like good? Devin says no like bad. Last time I tried to give you good advice and you didn’t take it. Just take my advice and lay low! Devin then whispers I am voting for you to stay. I just don’t want anyone to hear. Joey tried to get me out of the house. I promise you I am voting for you to stay. 1:45pm – 2:15pm Up in the HOH room – Frankie, Caleb and Zach are talking and congratulate Caleb on his speech in the veto ceremony. Caleb starts talking about people judging him just from his appearance before the know him. Caleb talks about how Joey is going home. He says that if someone threatens me, they better be able to beat me in this game. Caleb says that he told Paola to not campaign to just let the boys campaign for her. Caleb says you rock the cradle expect to wake up the baby! Zach says this week is over and done. Put it in the books & write the cheque. Then one of the bomb squad wins the HOH and we put up Brittany and Pow! Caleb says if anyone should be scared in this house next week it’s me because I am the strongest player in this house. Frankie says but that would never happen. Zach says except Brittany but you would still have two chances to take yourself off. Zach says even if you didn’t you have a guaranteed 7 votes. Caleb comments on how he has Hayden’s vote too because after the HOH he told Hayden he has his back to the end and Hayden said the same. Caleb says we just need to win HOH. Zach says we will. Caleb says we were supposed to win POV too and it didn’t happen. Zach says but it worked out better this way. Caleb agrees and says its better to not put Donny up either because until then we have his vote. Zach and Caleb agree we’re all power houses! Caleb says anyone that comes after me is stupid! Because me and my militia will come after you! Out in the backyard – Derrick and Cody are talking on the backyard couches. Derrick comments on how Caleb is getting a lot of blood on his hands. He says that he and Devin are making bigger targets for themselves. The cameras switch to Joey, Brittany and Nicole suntanning. Nicole asks Brittany what happened last night. Brittany tells her about the confrontation with Devin. After Nicole heads inside. Donny comes to get in the pool and Paola joins the girls. She asks Joey how she’s doing. Joey says she’s fine. Over by the couches – Cody gives Joey a back massage. I agree except for wanting Brittany to win anything. She just wants to be on TV. She’s never even seen BB before she was cast plus she drives a BMW and has an actor boyfriend who she can’t name for privacy reasons. There’s guys I don’t think deserve to be there also, but Brittany is playing that mom/divorcee card and getting alot of empathy from female viewers when she really doesn’t deserve it. forget her boyfriend, who is her ex-husband?? bc that’s where she is getting her money from. I wonder if he is in the entertainment business and has money. She’s got a bangin’ body though… in my humble opinion. I am 10000% hoping for Britanny to win HOH next week and Paola. I seriously hope these house guests are just humoring Caleb, he is such an arrogant a**. That guy is going to go crazy when he is nominated. This is the 1st season that I have seen, that no one is outside smoking. I think that great. Can’t wait to see how it goes after Thur. eviction. If the girls are weak players then they deserve to go. Period. (I’m female, btw) Although it is true that SOME females are given the short end of the stick in this game. Female players like Janelle are few and far between, unfortunately. I don’t see any of these girls remotely coming close to her level. The only one I see having a shot at this point is Amber. Time will tell. I think Amber has some game too. She was my pick to win it all in our BB family pool. Its really too soon to tell but a lot can happen in a week… Im betting the diary room sessions include suggestions to everyone to get pow pow out so they can continue on with Americas player plans. The girls need to STOP being afraid of the guys, and really try to stick together, if they dont want to be picked ofc one by one. I see none of them had Joey’s back. I hope something happens to keep her there. Afterall, she is the first member of our TEAM AMERICA! Note to all future BB contestants. If you are stupid enough to form an alliance before the last houseguest has entered the house, DO NOT out that alliance before first eviction has happened. Joey did this to herself and deserves to go. Nice launch to Team America. LOL! Queen of the summer? She talks big game but Powts when she’s a target. WEAK. I don’t know if Joey is the one going home… did we not all think Rachel Riley would go first in her first season and then the other girl went nuts… doesn’t always happen that the one who thinks they are safe because everybody else says the hate her…. so it may be PowPow that goes.. there are no guarantees this early. Go to facebooks fan page for Zach and watch his interview with Rachel Riley… she asks him if he has a gf and he says he hasnt had a gf since he was 12. lol then she asks him if he has a boyfriend and he simply says no. Its a pretty good interview. He insults her to her face a few times… kind of funny. Most of the guys are all giddy giddy working together. But Wait until they are against each other. The lying begins haha Frankie is a strong social player, but when sh*t hits the fan and he has to backstab, he better be able to sneakily hide it or he’ll be revealed as a huge target/suckup!! god i hope joey goes home. she’s turned into such a prick! Why would you risk someone elses game just to screw your game up?! i wouldn’t do it for a million dollars. though i’m really liking zach now, he is playing the besy game imo. 1) Joey hasn’t turned into a prick, she has to throw the spotlight onto someone else or she would go home. That’s what good players do. 2) You’re mad that she risked someone else’s game? Welcome to Big Brother. That’s what happens. 3) Zach hasn’t changed at all after entering the house. He’s still an annoying little b*tch. 4) You have a horrible argument. Gtfo. I think Zach has some gay tendencies and something is there with him and Frankie. He kept checking out Hayden while he was working out with Frankie. I think as he gets more comfortable, the more his true self comes out! I actually think a few of the guys have been touchy touchy with Frankie. Cody was hugging all over Frankie early on. I feel Zach came in to bb to be a villain and has actually shown that there is much more to him! Still so early though! Zach could “come out” in the BB house? “I think Zach has some gay tendencies and something is there with him and Frankie”. Yes, you may be correct there, reading Zach’s bio, he was asked “Which past Big Brother cast member did you like most”, He chose Andy. And watching his actions around the guys, he is to touchy, touchy with them. How you get a picture? You could question a lot of the guys’ sexuality then– Devin has asked Frankie for hugs, same with Cody, Caleb was all cuddly with him and lifting him up in the air and running around with Frankie on his back when he won HOH.. I highly doubt they’re all gay or bisexual. It’s nice that they’re so accepting of him; you don’t expect that with jocks. I’m still up in the air on player’s game, but I agree Frankie(unfair built in fanbase and all), has a good chance of staying a long while, with his social skills. Honestly, they are all nice but a little dull and uninspired to me. I am not feeling this crew as much as last summer’s crazy group. The feeds have been pretty boring these past few days. I’ve been contemplating and claiming, I might get the feeds, but this season isn’t worth it… If I was going to get them, last season would’ve been perfect. I can see a tiny bit of former BB Dan in Zach. These guys trying to stack their numbers a bit too early and I don’t see Devin being in the house long term. Zach changes depending on who he is talking to. He is very touchy feely with Frankie but he is all F bombs and bros with Devin and Derrick. Zach pulls the frat boy card with Nicole and Hayden. I am actually intrigued and can’t wait to figure out who he really is. He is much deeper and smarter, more manipulative than his early interviews showed. Really enjoyed watching Frankie lead he meditation on the first After Dark. He’s compelling and knows how to ingratiate himself to others. Zach was portrayed as an egomaniac in the intros but is really adept at blending into whatever situation comes up. Caleb and Devin are time bombs; appropriate to their alliance’s name. Cody is the Paul McCartney to this fab bunch. Prediction: Derrick may take it all. Derrick, with the wide open nostrils, is trying to rid the house of all the other house members who are ethically mixed. Seems like he would want to hold on to one or two to keep the attention off him.